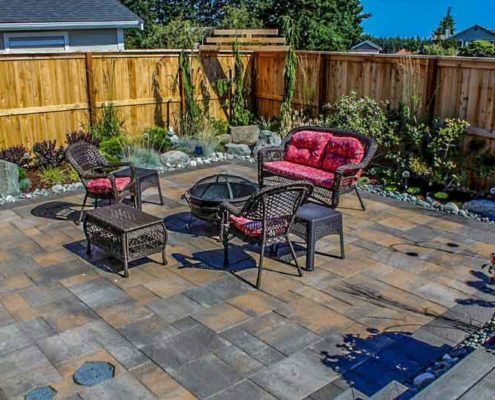 We don’t call ourselves the best landscaping company in Sequim or the best landscaping company throughout the entire Olympic Peninsula. For that, we leave it to our reputation and endorsements from our customers. If you are looking for a quality experience with results far exceeding your expectation, please give us a call or send us an email to set up your free consultation. We’ve worked with many types of contractors over the years and I have to say, our experience with Matt and his team at ONA Landscaping is genuinely remarkable. Our work with ONA started 4 months before installation. In that time and during installation we made multiple changes to the project: some simple; some not so simple. While this is not ideal from a contractor’s standpoint, Matt was gracious and professional with all of our requests. ONA exceeded our expectations with their workmanship, the time in which they completed the project and the quality of the materials used in the installation. We feel that we paid a fair price for ONA’s work. We were looking for quality work at a fair price and in our opinion, we received every bit and more of what we paid for. ONA has one crew – I think that’s a big part of their ability to deliver a quality product. Be patient: with their focus on one project at a time, it make take a little longer to get on his schedule, but in our experience, it was well worth the wait. We heartily recommend Matt Ward and ONA Landscaping and will use them again and again! Thank you ONA Landscaping! We love our new yard! Every morning, I drink my coffee next to our new pond built by ONA Landscaping. I can’t wait for our kids to visit and see your amazing work! We cannot contain our excitement over the quality of work that Matt, Micah and Eli provided for our landscaping project in Port Townsend. The Pergola, Pavers and Retaining Walls look incredible! The attention to detail is evident at every element of ONA Landscaping’s construction. Their final product exceeded our expectations. Matt and his team were a pleasure to work with. Matt provided insightful input to any concern that we had. He anticipated issues thereby mitigating problems we might face down the line. Whatever Matt said he would do, he did. His style and easy going manner helped put us at ease and Micah and Eli were also great at communicating with us. We highly recommend ONA Landscaping for your landscape project needs. Frankly, we would not even consider anyone else at this point. Very pleased with the landscaping from ONA Landscaping. Matt and Micah work quickly, keep the area clean, had great ideas, and were great to work with. The fence is beautiful and so sturdy, it should last a very long time. My backyard is now the nicest in the neighborhood. They even ate the cookies I baked without complaining. Everyone knows how home renovations and improvement can be stressful. I’ve actually known a couple or two who have split up over the process. Every once in a while, you meet someone that is so honest, helpful, and goes out of their way to really make a difference that it warms your heart. The entire process makes you want to share your experience with others. That is precisely what happened with Matt Ward, the owner of ONA Landscaping. From our first phone consultation, Matt went out of his way to accommodate my difficult schedule and arranged to meet me at an unusual day and time. He came out and took stock of our property and helped us work out a short and long-term plan. From there, he went above and beyond the norm to offer suggestions and provide referrals to other professionals in the Port Angeles/Sequim areas who could further assist us in our home and land improvement plans. Two of those referrals have been just as fantastic and are getting ready to do some work on our property as I write this review. I just can’t thank Matt and ONA Landscaping enough for making us feel like our project was special. They followed through in a timely manner to make sure that everything else we wanted to work on would move forward quickly. Matt is truly an artisan at his craft with outstanding customer service skills. Based on this, we will continue to recommend ONA Landscaping to our family and friends. I can’t recommend ONA Landscaping any higher. They provided landscaping all around my house in Sequim and it turned out beautifully. 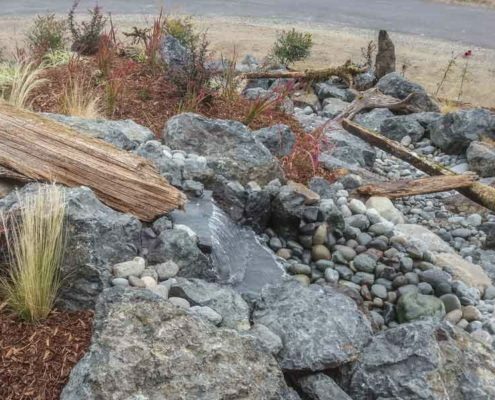 They planted all deer resistant shrubs/plants and dry creek beds with a water feature. Not only did the landscaping turn out GREAT, but Matt and Micah were the best landscapers to work with. More than business associates, we became friends. I wouldn’t do business with anyone else, EVER! We are overjoyed that we hired ONA Landscaping to landscape our new home. Owner Matt and his crew had great ideas to make all areas beautiful through a variety of plants and design. The ONA Landscaping team was very cooperative, on time and always hardworking. We recommend them without hesitation and look forward to many happy days in our new yard. ONA Landscaping is absolutely wonderful. We had them landscape our new home, which included grass, plants, trees, shrubs, and an amazing fire pit. We couldn’t be happier with their level of professionalism and the final product. Fantastic company, excellent landscaping! 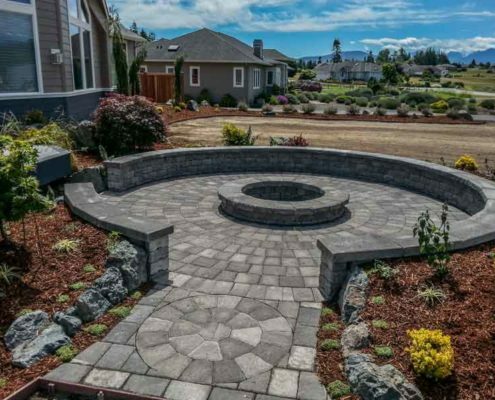 Simply the best landscaping company in Sequim. Proudly Serving Sequim, Port Angeles, Port Townsend and the entire Olympic Peninsula since 1977.